I recently won a drawing–something that seldom happens to me! 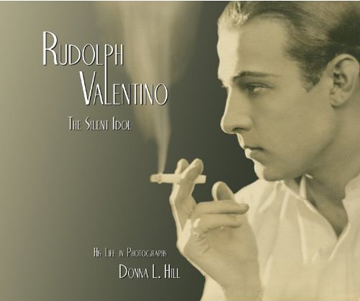 The prize was a book I had been coveting for some time, Rudolph Valentino: The Silent Idol by Donna Hill. Valentino was born in 1895, the same year in which the Lumière brothers first showed films to the public. He is one of the few silent-film stars who is still remembered and recognized by much of the American public. A handsome Italian who wasn’t sure what his destiny would be but was sure he HAD a destiny, he came to the United States at the age of 18 and began his career as a dancer. His dancing skills would help establish his stardom in his breakthrough film, The Four Horsemen of the Apocalypse (1921). The dance scene in Four Horsemen started a national craze for the tango and is still breathtaking to watch. 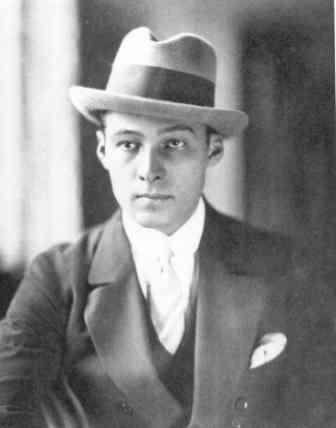 Valentino made several hugely successful films before dying of a perforated ulcer in 1926. Donna Hill became a lifelong film fan when she was ten years old. She saw her first Valentino film, Blood and Sand, on her local PBS station shortly after that. She bought her first Valentino photograph in the mid-1970s when she was a teenager. She now owns hundreds of photographs of the star; she tells me that she hasn’t counted but thinks the collection numbers between 700 and 1000. Her book, which came out in 2010, uses her collection to illustrate the life of Valentino. (Its subtitle is “His Life in Photographs.”) Other books have been written about the actor; in fact, Donna lists most of them on her Valentino website, called Falcon Lair after Valentino’s beloved house in Beverly Hills. This one is unique in that it literally gives the reader a look at this much photographed icon, at work and at home. Donna Hill is my favorite kind of film scholar. She writes about film because she loves it. She will spend months following a tip that might give her just a little more information about long-lost artists and pieces of celluloid. She is currently at work on a biography of Dorothy Gish, the less well known (but in the eyes of many equally talented) sister of silent-film star Lillian Gish. Donna’s book shows that stardom at work on the screen and in Valentino’s personal life. The photographs are stunning, and so is their subject. 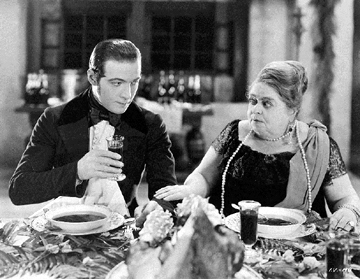 By the time the book gets to the actor’s untimely death at the age of 31, the reader has been drawn into Valentino’s world and mourns that death. Naturally, as soon as I saw the book I wrote to Donna and asked for a recipe. She told me that Valentino loved seafood, having grown up in Puglia, a coastal region of Italy. “When times were lean [in his early days in Los Angeles], he went to the beach for shellfish,” she informed me. He also hunted small game to put food on the table when necessary. His mother was French so he adored French as well as Italian food, Donna reported. And he loved preparing pasta for his friends. One special meal some of them remembered was a spicy dish of six-foot-long pasta with garlic, hot pepper, and olive oil. Donna also sent me a version of the recipe below, which has been making the rounds of Rudy fans. She wasn’t 100 percent certain it was authentic, but its use of fish (anchovies!) as the “secret” ingredient seems right up Valentino’s alley. (They are secret because they disappear into the sauce, leaving only a hint of their haunting flavor.) Until I find six-foot-long spaghetti for the spicy sauce, this is my Rudy Recipe. Heat 1 tablespoon of the oil in a Dutch oven and sauté the onion pieces and mushrooms over low heat until they soften, adding a little water if needed. Add the tomato sauce, the tomato paste, and the whole tomatoes. Continue to cook over low heat, partially covered. In a separate skillet sauté the sausage pieces, adding the second tablespoon of oil if they start to stick. Add the garlic pieces as the sausage cooks. When the sausage has browned, scoop the pieces of sausage and garlic up and pop them into the Dutch oven. Stir in the oregano and rosemary as well. Deglaze the skillet with the red wine, and add the wine and any pieces of sausage that are in it to the Dutch oven. Stir in half of the anchovies. Simmer the sauce for 10 minutes, partially covered, and taste. Add more anchovies as needed. (I just threw them all in.) Cook for 30 minutes more, stirring occasionally. Cover the pot and/or add a little more wine if the sauce starts to get too thick. 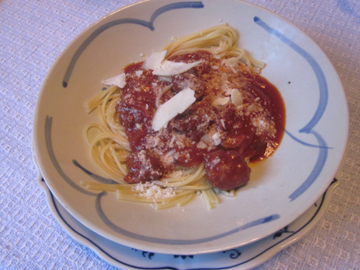 Serve with spaghetti and grated cheese. Serves 4. This entry was posted on Friday, June 8th, 2012 at 4:00 am	and is filed under Pasta and Pizza, TV and Film History. You can follow any responses to this entry through the RSS 2.0 feed. You can leave a response, or trackback from your own site. Wow, thanks for a wonderful post. Like the piece on Valentino. When in NYC, Valentino owned and lived in a home in Bayside, Queens, right off the Throgs Neck Bridge (the bridge came later). That home is now a restaurant, Valentino’s on the Green. When we lived on Long Island, we ate there often with Merri’s aunt who lived in Bayside. It is a pretty home with quite good Italian food. Toby–Maybe I can get a recipe from the restaurant sometime. What fun! And thank you, Donna; I really loved the book. First, I love the name Rudolph…that was my father’s name and is my brother’s name. On top of that, they are all very handsome, so maybe Shakespeare got it wrong…maybe there IS something in a name. The sauce sounds very good. I would probably add some red pepper flakes (not that Rudolph Valentino wouldn’t be able to heat things up without the help!) Good post. Well, actually, his name was really Rodolfo–but it’s a pretty close translation! The red pepper would be great. Thanks, Grad……. I hadn’t realised that he died so young …… but then perhaps that is part of his enduring charm …. he didn’t grow old and wrinkled! And of course there is no saying he would have made it into the sound era, Anne; lots of Latin lovers disappeared when sound came along. I’m sure he would have appreciated being able to try, however! Love your post and am going to do some more exploring around your blog soon. 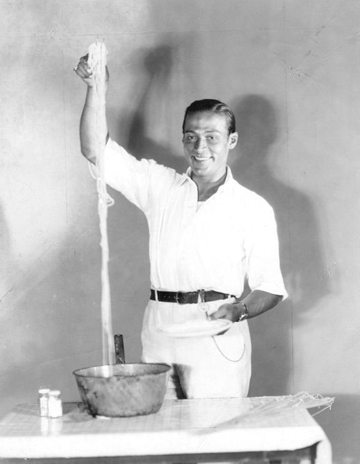 I blog about film stars and their favourite recipes and I’ve made this a few times. It’s DIVINE! Stumbled upon your nice post whilst trying to find out exactly where this recipe was published. I’ve heard that he gave the recipe to Hedder Hopper so I’m off to ferret around to see if I can find a Hedder Hopper expert! Hi, Jenny–I follow your culinary adventures, and I’m honored that you visited my blog! Please let me know if you discover any more details. I will pass them on to Donna as well; I know she will be fascinated.